Cosplay is a wonderful hobby that allows people to become their favourite characters. Sometimes there is nothing more frustrating however then trying to share something you've done or accomplished, only to be met with a wall of "Well what you should have done is this." Worst of all, many of these comments come from people who do not cosplay themselves. While everyone is entitled to their own opinion, personally, I can't help but feel these words are extremely rude. Why? 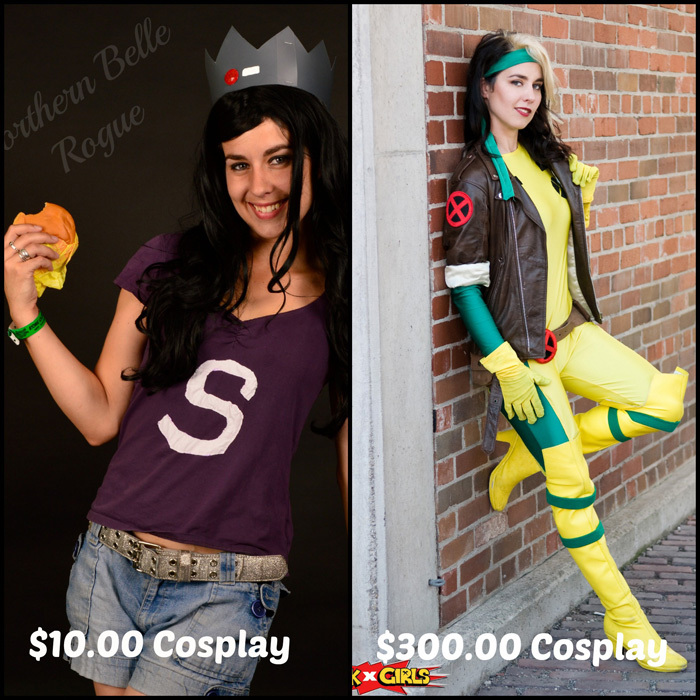 What a lot of people may not realize is how EXPENSIVE cosplay can be, and how DIFFICULT is can be. Confused? Let me elaborate. One of the most common questions I get in interviews is "How much does your average cosplay cost?" and the issue with this, is that it really varies. Some I�ve managed to put together for less than $10.00 while others have cost up to $300.00 in materials alone. Of course if you are commissioning a costume, you are not only paying for the materials but also the person�s time and skills, so they tend to be on the pricier end. For now, I�m going to focus on costumes that are homemade. If you can manage to create new cosplays for 25.00 or less, that is wonderful, however near impossible for elaborate characters/costumes/props. 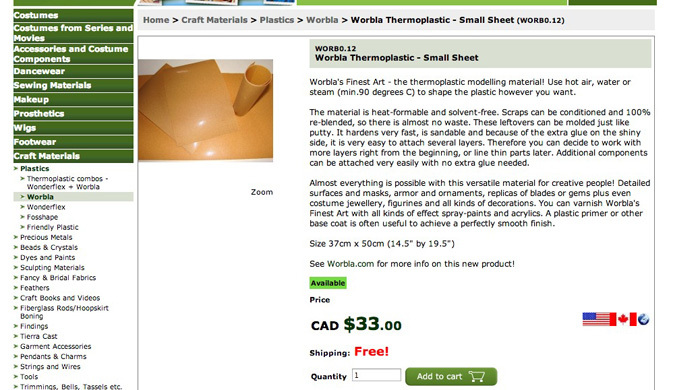 Materials such spandex can cost as much as 40$ for just enough for a suit, a 14.5" by 19.5" Sheet of worbla is $33.00 and these are just base raw materials that you will still need to craft/sew/paint/alter. This doesn�t take into account any accessories, shoes, wigs, make up, or the materials to make all these� the expense list can sometimes be daunting. It should really come as no surprise to anyone who has tried their hand at cosplay, how expensive it can be. What�s worse? These kind of numbers also assume everything goes perfectly. Remember when I said cosplay is also difficult? Let me elaborate on that. With social media and the increasing popularity of conventions and masquerades it is no surprise that many professional costumers have also become cosplayers. However, as I detailed in this article here, "What is a Cosplayer?" not every cosplayer is a professional costumer or has such skills. Many cosplayers have different careers, experience, and training, a lot of which may be irrelevant as a whole to the creation of costumes. It doesn�t make their cosplays any less. Now, let�s say that this is your first time working with spandex� it can be tricky and is possible you might cut or sew something wrong. Pending on your mistakes you may have to go back out and buy more materials, or adjust your design. These things happen and can affect the end result in either cost, style or both. Now, please do not misunderstand me, I am not saying that constructive criticism is unwelcome or even that you should love every cosplay you see. What I am saying, is when you comment about someone�s cosplay either in person or online and say "Well you should have done� blah blah blah..." it is extremely rude. You have no idea what this person went through to be able to create the costume before you. You have no idea how many hours they slaved, or different materials they tried, or how many times they repainted something... it�s a slap in the face to all the hard work that this person has put into their cosplay because it isn�t up to YOUR standards. 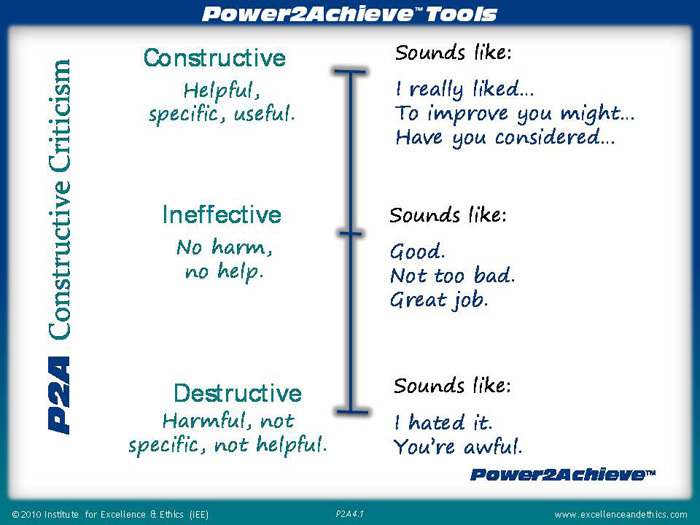 Constructive criticism never assumes or tells a person what they "should" do. Constructive criticism instead opens a dialogue with the person. First of all, I think everyone who wants to offer "constructive criticism" should take a second to think of why they are offering this piece of advice. Is it because you think the costume would look better that way? Is it because this person has mentioned that they intend to upgrade the suit? Or are you simply relating a similar technique you�ve used in other cosplays? Each of these come from a different place, but if the only reason you are offering "constructive" criticism is to tell them how you would have done it, because you think it looks better - perhaps it is not all that constructive. Both of these could be a standard response to being shown something. Yet we can clearly see the difference in tone between them. I, personally, have great difficulty with this. I�ve a strong personality and I am very passionate � even in person sometimes people mistake me for angry when I�m simply trying to communicate. As a result, sometimes I feel I over explain in text. If I write a statement and I�m worried that it could be read in a more negative light, I make sure to add a smiley face, or a second line to expand my thoughts. Sure, sometimes we are misinterpreted and people might be irritated, but the difference lies in taking the time to effectively communicate to ensure both parties are on the same page. "Nice Resident Evil Alice cosplay, but you should have put the slit on the other side." "Nice Resident Evil Alice cosplay, when I did it I put the slit on the other side." ...putting the onus on that person that they should do something because you say so, is rude. If you turn it around however, and talk about your own work it comes across like you are actually interested in starting a dialogue and can discuss why each of you made the choices you did. Furthermore a teacher once told me, anything anyone says before the word "but" doesn�t count. In the end it is all about respect and how you approach people. The golden rule always rings true in that you should treat people how you want to be treated. Think about how the comment would make you feel if it was left on your photo. Cosplay is a beautiful thing, but remember that people are able to express themselves without having to subscribe to your code of what it "should" be.